So, convinced by my experiences of the Cross twins’ dry nibs, I set out to find a pen that would give me a smoother, inkier page; and sure as hens can lay baby chickens, you get that from the Platinum 3776 Century with the solid 14K gold music nib. Do you like broad nibs? Do you like thick lines and lots of ink? Then this is your pen my friend. If you want to try a music nib, but don’t want to pay a premium price, Platinum is the way to go. Done. Sold. The Platinum it was then. And it was everything they said, and more. And the “more” was all ink. Don’t get me wrong. I love this pen! I love the simple elegance of the black and gold, the rounded ends to both finials (the bottom of the pen, and the top of the cap for anybody looking that up—no, it’s not a word most people encounter every day; I looked it up the first time too). 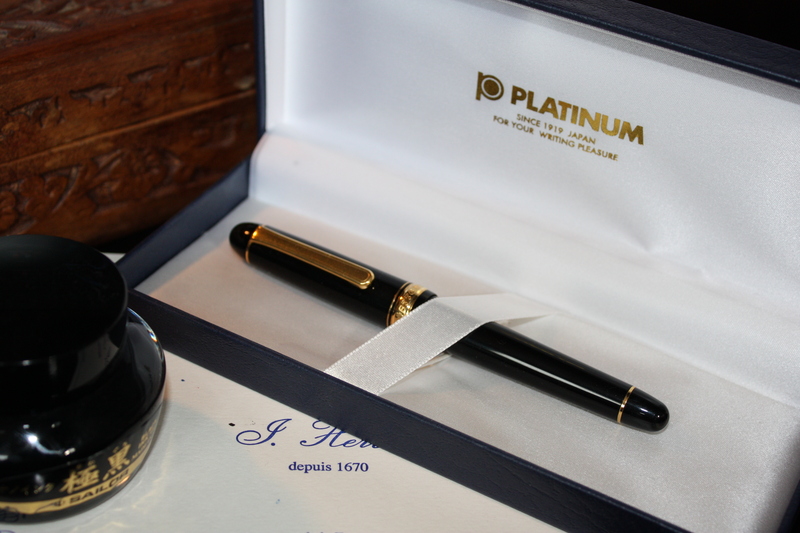 Platinum 3776 Century, three-tined music nib… a thing of beauty. Pity the same cannot be said for my photography, but you get the idea. 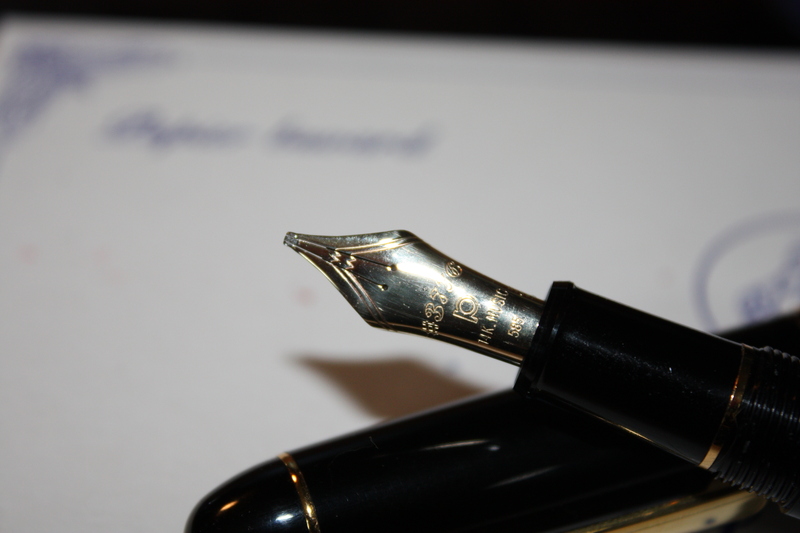 Look carefully at the nib, and compare that to my illustration of a generic fountain pen nib, here. This solid, 14K gold nib, has three tines, compared to the more usual two, and two breather holes, as opposed to one. This allows for a much greater flow of ink; and the reason they are called “music” nibs, is because that was what they were originally intended to write—music composition. The distinctive shape of this kind of nib, allows for the narrower downstrokes, and wider horizontal lines, which produce the variation necessary for music notation. Don’t write in and tell me how bloody awful my handwriting is, believe me, I know. It hasn’t improved since I was 12, and I do work on it. Sorry, get used to it, there will be more. 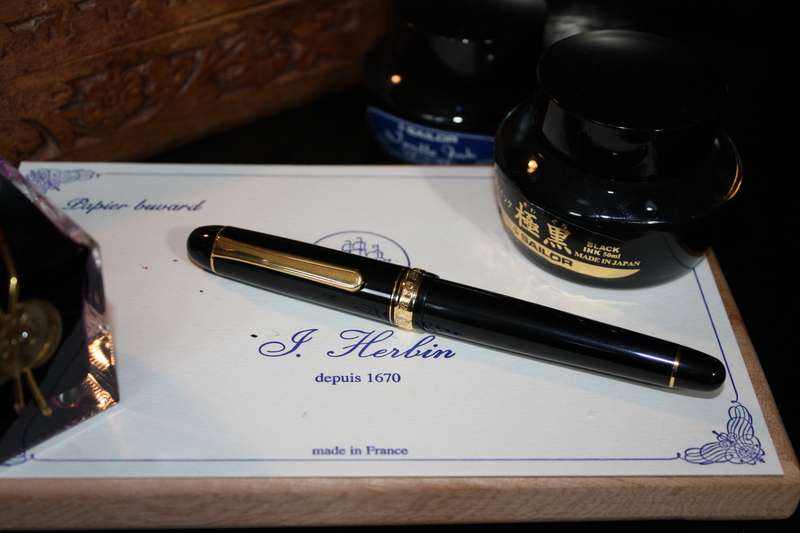 As you can see, this beautiful nib puts a lot of ink on the page; which, in this case, is J. Herbin’s Perle Noire. A nice, deep, true black, that flows beautifully and dries nice and fast. But even with a pretty quick-drying ink like this, and good quality paper like the Clairefontaine in the Rhodia notebook, I would blot before I turned the page or moved my hand over it. In fact, with my handwriting, especially on shorter notes, the line for individual letters often becomes too thick. But still I love it; this is my first high quality fountain pen, and it took my breath away when I put that gloriously smooth nib to paper for the first time. The nib has no flex in it whatsoever, and feels very firm when a little pressure is applied. But I’ve always thought that the point of flex nibs was to allow for more line variation on the page, and given that line variation is the whole point of a music nib, well… maybe I’m missing something, but flex in this nib doesn’t really seem to matter. Did I mention how much I love this pen? And how incredibly smooth it is to write with? Good. We should get that straight. The Century 3776 boasts Platinum’s slip & seal technology in the cap, which they claim provides “complete air tightness” with a screw-type cap, thus preventing the ink in the pen from drying out for about a year. I don’t know anybody who has actually tested the claim, nor anyone who would want to, but I can say that I’ve left this pen inked up for about a month without a problem, and certainly it has never had a dry start. This is not a big pen. In fact it’s the joint smallest I own along with the Platinum Plaisir (more on that in a later post), at 119.5mm long from the tip of the nib, to the outer edge of the curve of the bottom finial. There are only two real gripes I have with this pen, firstly, it needs to hold more ink. The cartridge and the converter simply do not hold enough ink for this pen to be used conveniently as a regular writer. It really needs the capacity of an eyedropper fill. Secondly, and this is the kicker for me, as much as I love this pen (I have made that clear haven’t I? ), the sheer amount of ink it puts on the page, means that I can’t use it as my daily carry.